Rugga World: General Discussions: Hearty Congratulations Victor!!! General Discussions: Hearty Congratulations Victor!!! 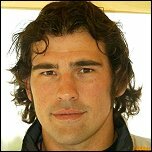 The Independent Online are reporting that burly and towering Springbok lock, Victor Matfield and his wife have just had a baby girl. Rugga World wishes both Victor and his wife, Monja, heartiest congratulations!! May she bless your life with happiness. Victor Matfield, Springbok and Blue Bulls lineout king, and wife Monja celebrated their New Year with the birth of their first child, baby Jaime. Thrilled at the prospect of parenting, Matfield said that he was not afraid to deal with dirty nappies: "I've just seen the first nappy change and it was a bit gross but I'm looking forward to my first change... Nappy duty, if it's your own child, is wonderful." Born at 8.02am on New Year's Day, and weighing in at 3,25kg with a length of 51cm, little Jaime may yet make the girl's rugby team. But daddy Victor would rather see her playing hockey and hopes that his next child will be a boy with whom he can play cricket, soccer and rugby. "I'm so happy, especially since we hoped for a New Year's baby," said Matfield, smiling and showing off pictures on his laptop of mom and daughter. "I hope that my next child will be a boy. My sister has two boys so my mother is happy that she now has a granddaughter as well," the rugby star said. Jaime will probably make her debut at Loftus Stadium in Pretoria, home of the Vodacom Blue Bulls, during her dad's Super 12 games this year. The already protective dad is certain that the private suite and family environment will keep her safe from noise and harm. "She has dark hair like me and my wife says she looks like me but I can't see that yet," said the 2m- tall lock. "I've got three days that I can spend with them this week, then it's back to training," said Matfield. "Everything about a child is so special and they grow up so fast. I'm looking forward to every single little moment." Geluk aan die Matfield familie.Mag all julle drome oor die kleintjie bewaarheid word. Dink julle die kleintjie leer al lineout calls? Sal nogal snaaks wees as haar eerste woorde iets soos:" 12-7-58-3-2" is.